You've never seen anything like this! Based on European Zipline Parks, Yellowstone Aerial Adventures has built one of the first of it's kind right in West Yellowstone. A central location in town means the Park is within walking distance of most hotels and only 3 blocks from the West entrance of Yellowstone National Park. $29 "Junior Ranger Course" (ages 4-8) Includes 1 free Adult. $99 "3 of 5 Day Adventure Pass" The best value is the 3 of 5 day pass. The pass allows for unlimited use of the Park for 3 days and includes come and go privileges on those days, all day. A great option for families staying in West Yellowstone! 6 yrs. old and up for the Main Adventure Course and Ziplines. 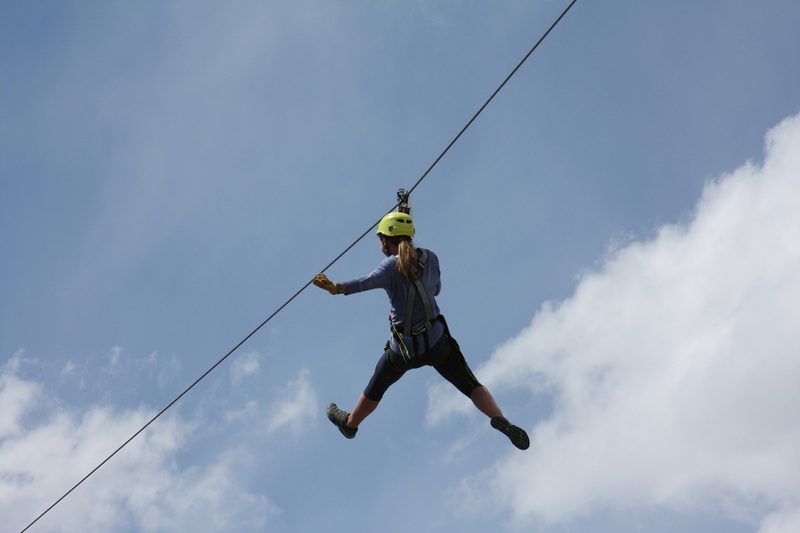 Save $25 pp at the Zipline Park when you combine this adventure with a rafting trip. $29 The Junior Ranger pass for kids 4-8 years old. An adult can accompany the kids. Zipline tour at the Big Sky Resort - Most exciting! Ready for one of the fastest and longest zip-line adventures in the West...? Look no further! The Adventure Zip Tour at Big Sky Resort serves up amazing, panoramic mountain views and scream worthy zip-lines at 50 miles per hour. Sound fun? This is your ticket to ride. First you will get geared up and meet your always entertaining guides. Your adventure will then begin with a 15 minute chairlift ride up the slopes of the country's largest ski resort. From here you will embark on a high speed adventure over the treetops and canyons of the mountainous terrain. Keep your eyes open! Moose, bear and deer are never far away. Finally, don't forget to smile. Professional photographers will be taking photos of you with some of Montana's most magnificent peaks in the background. Daily. Times vary and we will let you know when a reservation is made. Your quite a bit closer to the ground and traveling slower, so if you are nervous or really afraid of heights, this might be the tour for you. Still an exiting tour!